Sumud Palestine was pleased to host Hilary Tyrell and Philip Nixon for a light Palestinian lunch followed by Hilary’s presentation on the plight of 240,000 Bedouin in the Negev who, despite being Israeli citizens suffer extreme discrimination. Some 70,000 live in so-called “unrecognised villages” which predate the establishment of the State of Israel in 1948. 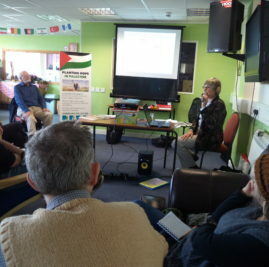 Hilary’s talk was accompanied by pictures and she also brought with her photographs taken from Women’s Voices from the Negev – Yusawiruna – which was initiated by a joint Jewish-Arab organisations, the Negev Coexistence Forum for Civil Equality. Through photos Bedouin women record their lives and the human rights abuses to which they are subject by the State authorities. You can also add your voice to the “Avaaz Umm al Hiran” petition calling for a solution to be found so the villagers of Umm el Hiran can remain in their homes and continue their agricultural lifestyle. Around 24 people participated in this event. Sumud Palestine was especially pleased to welcome Suha from Nablus and Hassan who arrived in Newcastle as a member of a group of 10 families on the government sponsored programme for vulnerable Syrians. Hassan was an interpreter for Save the Children in a refugee camp in Jordan. He is now making use of his language skills helping Arab speaking asylum seekers at ASHA. It would have been lovely to have welcomed twice the number of people but the meeting ‘gelled’ and everyone enjoyed it and the lunch beforehand.